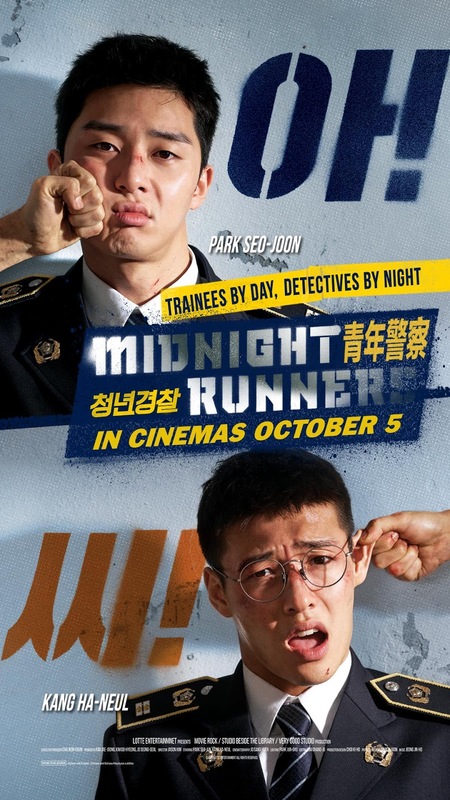 Directed and written by Kim Joo-hwan (Koala), Midnight Runners follows two young ordinary Korean National Police University students, Park Ki-Joon (Park Seo-Joon) and Kang Hee-Yeol (Kang Ha-Neul), who witness a kidnapping during their night out and decide to try to find and save the victim on their own after the lack of immediate action from the authorities. The great Hollywood buddy cop action comedies such as Lethal Weapon (1987), Bad Boys (1995) and Rush Hour (1998), just to name a few, have these few things in common that made them classics of the genre — natural chemistry between the two lead actors, brilliant humour, engaging police procedural plot and highly entertaining action sequences. Midnight Runners is almost as good in every one of these aspects while incorporating its own relatable values into it. Like most buddy cop flicks, the two leads are straightup opposite characters — Park Ki-Joon portrayed by Park Seo-Joon (Fight for My Way, Hwarang: The Poet Warrior Youth TV series) is the more casual, carefree one while Kang Hee-Yeol played by Kang Ha-Neul (New Trial, Dongju: The Portrait of a Poet) is the thinker who’s more serious and controlled. The comedic chemistry and performances by both of them are absolute perfection, backed by highly hilarious and mostly realistic dialogues. The film’s first few scenes are a little dull and cheesy but once it’s through that, it’s all fun and laughter. What I admire the most about the film is that its plot actually explores some serious, dark subjects in Korea (that are relatable to other countries as well) such as organ trafficking, frustrating issues within the police system, and… how difficult it may be for public servants such as policemen to get a date. While it criticises things like how ridiculous certain things are taught in police school and how long it takes for any reports to be investigated, it also provides valid reasons and explanations — almost like a propaganda but it’s acceptable. The film manages to offer some emotional weight that engages audience to get behind the hilarious but rightfully heroic protagonists. The payoff at the end is genuinely touching. The mid-credit scene got my eyes a little teary. Post-credit scene: There’s a mid-credit scene that I would recommend viewers to stay for. Malaysian censorship: Doubt anything needs to be cut. Verdict: The best Asian buddy cop action comedy I’ve seen in recent memory.